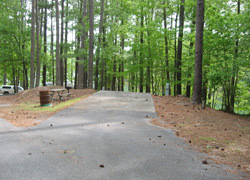 The park is located of off Bartow Beach Road in Cartersville. Its location, in the northwest part of the park (and north of the dam) means this park is often less busy than many of the lake's more southern parks. There are many amenities in the park. For day trippers, you will find a boat launch, playground facilities and some picnic areas. If you want to have a large group event, you can rent one of the picnic pavilions. There is also some Lake Allatoona shoreline fishing access form Bartow Gatewood Park. The park's more popular attraction is its campground. There are sites with water and power hook ups and some primative tent sites. When you camp in the park you have access to the park's swimming beach, which also has a bathhouse..
To make reservations for camping or to reserve a group picnic pavilion you can call 770-387-5163. The picture above shows one of the pull in campsites at the park. 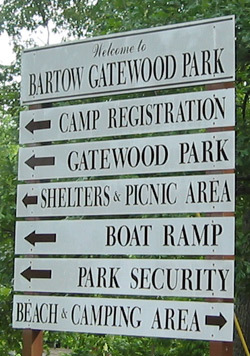 On the right is one of the signs that greets you as you enter the park from Bartow Beach Road. The park is located just across the lake from Red Top Mountain.